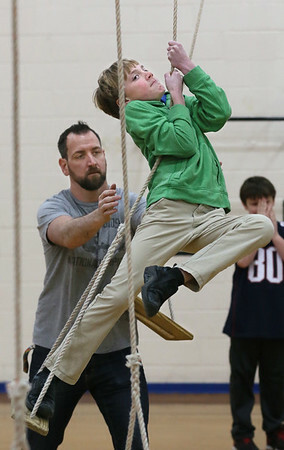 Fifth-grader Jack Bediz uses all his strength to navigate the bosun chairs course as physical education teacher Greg Marche stands by to catch him during a Project Adventure lesson Monday at Essex Elementary School. Students on the bosun chairs course have to find a way to step across a series of rope-suspended chairs that are spaced at a challenging distance from each other. The purpose is to improve coordination, balance and teamwork.